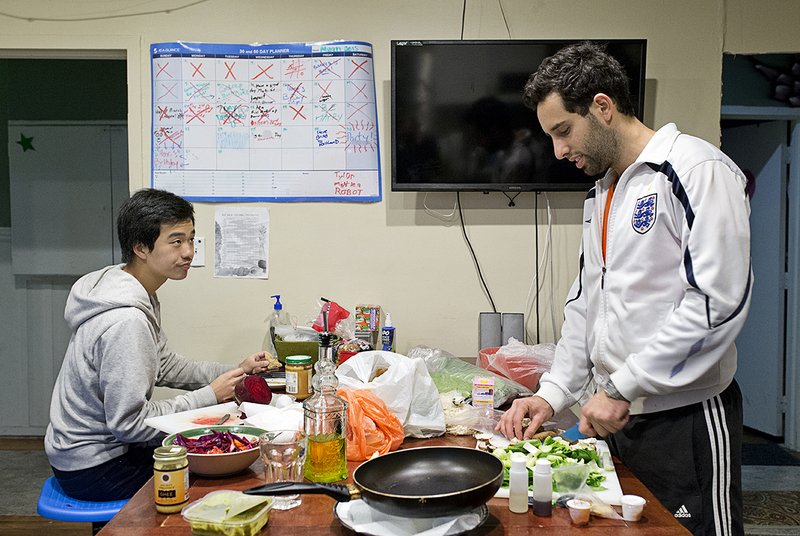 Lior Neu-ner (right) cooks while his housemate Darren Lee eats dinner in the communal kitchen at 20 Mission, a co-living house, in San Francisco, Calif., on Monday, March 23, 2015. Around 40 people live in the building, which is a former single room occupancy hotel that had been vacant for several years before being turned into the co-living space. Many of the residents are start-up entrepreneurs and the community is a mix of temporary occupants with people who have made the space their home on a more long-term basis. Neu-ner was living at 20 Mission for a few months while in San Francisco to participate in a start-up accelerator with his parking app Parko and Lee lived in the house temporarily while transitioning to the city.